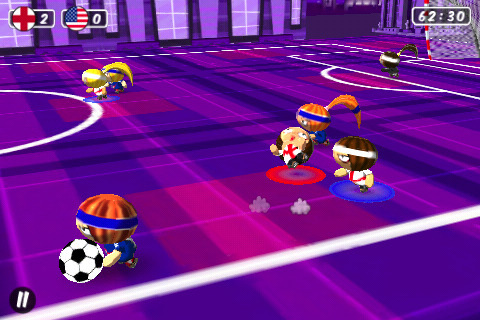 From the makers of Chop Chop Ninja, Chop Chop Tennis, and Chop Chop Runner, comes the new game Chop Chop Soccer. 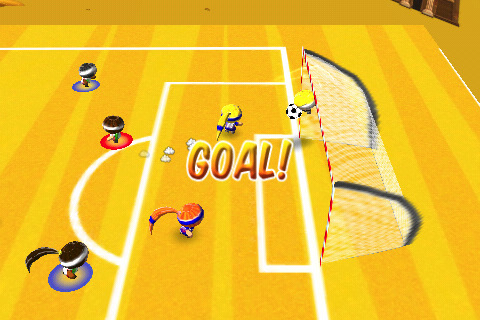 I think this Chop Chop is the Mario of the iPhone. In one game you save a princess, in another you play tennis, now you have soccer, and actually Mario is missing a running game. All they need now is Chop Chop Party, Chop Chop Karting, and Chop Chop Brawl. Just to name a few. Very simple game play, don’t worry if you don’t know how to play soccer, because it doesn’t really use the rules of soccer, in fact, you can kick the ball out of bounds and trip your opponent, you get no penalties for that. Now that I think about it, if it has a rule, it must be Have Fun. There is a lot of fun to be had. Now I’ve only played chop chop ninja, so I’m not sure what the other 2 were like, but in chop chop ninja, you learned as you played. In this game they dedicate a section to tutorials so you can get used to the controls (which I will talk about later) and the tutorials are great, they don’t rush you with a time limit, they explain it in the simplest way possible, and it’s all just to have fun. There is a single match mode if you just want to play one game; here you choose which team you want to play, the difficulty, how long you want the game to last, the team the CPU will be playing, as well as which field you want to use. The teams are 3 vs 3, and that isn’t counting the goalies. Then there is the tournament mode where once again you choose your team and you choose a tournament to play in. Difficulty is set so don’t expect to beat them on easy. Once again, this being a mobile game, it is something I expect to pick up anywhere and consume 5 minutes of my life. Very easy to do that with this game if you play on single match mode, it gives you anywhere from 2 to 5 minute matches, and the only way you go over is if you get sudden death. So very mobile and challenging if you don’t have a lot of time. The controls are a big part of this game. Instead of joysticks and tilting, this game is full touch, with no controls in blocking your screen. It uses touch gestures, which are intuitive enough to know whether you want to pass it to another player or go for the shot. There are some instances though where the gesture might be interpreted wrong and you might end up doing something you didn’t want to that ends up costing you the game…but those are rare instances, because it doesn’t always cost you that particular game that had gone into sudden death for a good 4 minutes. Like I said the tutorials explain the controls in a very simple understandable way and since there is no time limit you are allowed to play there as long as you like until you feel comfortable with the way you handle the controls. Now, one of the problems with the rare instances that can cost you matches might be in the controls themselves. Some of the gestures are so similar, that the only difference is the where the end of that gesture lands, whether it’s on or in the direction of a player, or goal. The game is in 3D, and not the 3D sweeping the nation, I’m talking about the not so annoying one. The graphics aren’t going to wow you or anything, but they are clean enough so it doesn’t bother you either. The 2D graphics vary in some parts they look more crisp then others. Some of the stadiums also look better than other since some of the textures don’t look as stretched out. It still looks like it was planned and not just thrown in like some other games. Overall cute style graphics, they were making the game more enjoyable instead of worrying about the look, and it still looks good. You can choose from 3 different camera modes and instead of describing what they look like we can see it on the invisible screen behind me that will have the game play on your end. Multitasking!! Right out of the virtual store, I didn’t even think about it until I had to leave a game, I came back, and there it was! That’s a plus for me. Unlike chop chop ninja and runner, there is no support for open feint so you don’t have leaderboards or achievements. One thing that would have made this game even better, would be multiplayer, but multiplayer would be a great addition to an already awesome game. This will get a 4 1/2 out of 5 for the gameplay it offers, the mobility, the cute graphics, the only problem being the similarity between some of the gestures in the controls. Otherwise great game, .99 cents right now as an introductory price, so get it while it’s hot.